The federal government has announced that Neo Ventures Biotechnology Inc., will receive $106,222 to help bring to market their innovative Targeted Chiasma (TouCH) Platform technology. This new tool will allow growers to improve the quality and consistency of protein, oil, and other traits in grain with a topical application to the crop at flowering time. The technology will improve the consistency of the grain by minimizing the environmental influences on the production of the proteins responsible for good baking quality. 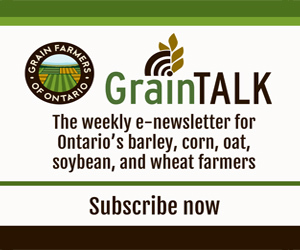 By offering processors wheat with the right protein consistency, Canadian wheat growers could net a premium of over $22 million annually from domestic market alone. As an alternative to genetic crop modification, this technology could open new premium markets for Canadian wheat around the world. More than $800,000 will be invested by the federal government to help the soybean industry develop varieties that match the tastes and demands of the Japanese consumer. The Eastern Canada Oilseeds Development Alliance (ECODA) will test soybean varieties and related soy products for their individual taste, texture, odour and appearance to find the variety that best matches the demands of the Japanese marketplace. Plant breeders, genomic and bioscience researchers, growers and customers will all be involved in the evaluations. This screening system will identify the biochemical compounds in soybeans that give soy products their distinct taste and texture, and will link this back to soybean breeding work.